The single cable solution (SCS open link) not only reduces the space required for cables in machines by 50%, the user also achieves significant savings in terms of installation and energy costs. The standardized open source feedback interface SCS open link from Hengstler has been certified by TÜV Rheinland for use in functional safety applications up to SIL3. Space-saving cabling systems are an essential topic in drive technology, because the requirements for compactness and efficiency of machines are constantly increasing. 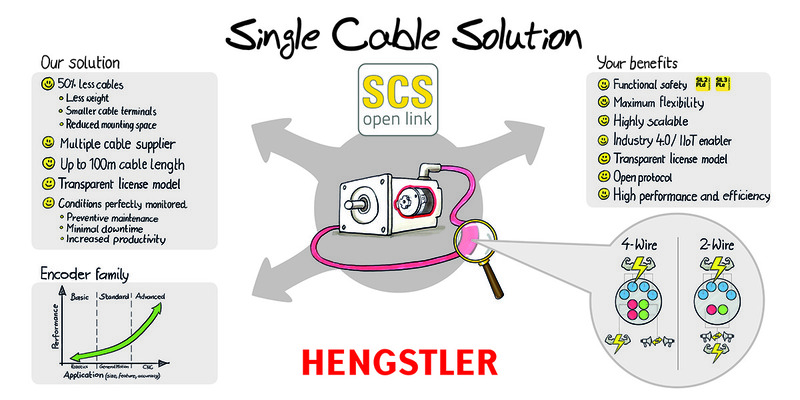 Hengstler has therefore developed the innovative single cable solution SCS open link Performance data and encoder signals are transmitted via a single cable. SCS open link is based on an innovative interface developed by Hengstler, which supports 2- and 4-wire applications, is Industry 4.0-capable and allows cable lengths of up to 100 m. The interface offers fast, interference-free data transmission and is suitable for machine builders, drive manufacturers and motor OEMs seeking to connect rotary encoders or other IoT sensors. With SCS open link data transfer rates of up to 10 MBaud and controller cycles can be achieved up to 32 kHz. Through cooperation with the Baumer and Kübler partners, there are many possible applications for drive manufacturers and mechanical engineers. The standardized open source feedback interface SCS open link from Hengstler has been certified by TÜV Rheinland for use in applications up to SIL3. The interface can thus be safely used in all machines and systems of the categories SIL1-3. This is an important decision criterion for potential users of mechanical engineering, because the functional safety of plant components is becoming increasingly important due to the increasing complexity of the overall systems .